Stormpaw pulled a thrush from the fresh-kill pile and carried it over to Fireclouds to share. Tawnyeye pricked up his ears and padded over to hear what Seastar had to say. "We gather today to welcome three kits into their lives as apprentices." continued Seastar once the clan had gathered. "Adderkit, you will be known as Adderpaw. Doveleaf, you will be mentor to Adderpaw. Sparrowkit, you will be known as Sparrowpaw. Boneflower, you will be mentor to Sparrowpaw. Fuzzykit, you will be known as Fuzzypaw. Scarhorse, you will be mentor to Fuzzypaw." Adderpaw quietly padded over to Doveleaf. Fuzzypaw stuck his nose into the air and padded over to Scarhorse. Sparrowpaw quietly padded over to Boneflower. "Ready to go see the territory?" meowed Boneflower as she touched noses with Sparrowpaw. "Let's go work on your hunting." meowed Doveleaf as he touched noses with Adderpaw. "Go get to know your new denmates." meowed Scarhorse as he touched noses with Fuzzypaw. "Adderpaw, Sparrowpaw, Fuzzypaw!" cheered Dreamheart for the clan's newest apprentices. Muddypetal padded out of his den, dragging the body of Seastar in his jaws. He made his way to the center of the clan camp, arranging the leader's body so the clan could grieve. Burningsong padded forward and pressed his nose into Seastar's fur. Violetpoppy padded forward and pressed his nose into Seastar's fur. "It's time." meowed Muddypetal to Violetpoppy, turning to lead the tom out of the clan camp. Violetstar raced back into the BreezeClan camp with Muddypetal, letting out a yowl as his paws touched the center of the clearing. "Cats of BreezeClan. Listen, And I will appoint the new deputy. 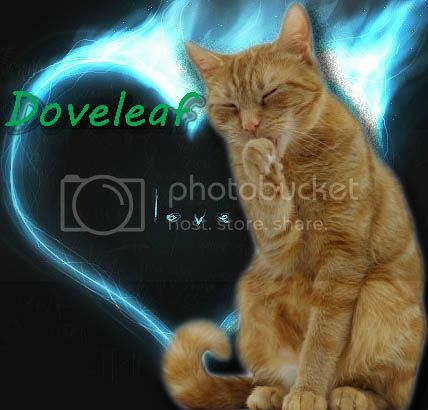 I say these words before StarClan so our ancestors may hear my approve and choice...Doveleaf will be the deputy of BreezeClan!" "Thank you, Violetstar." meowed Doveleaf with a dip of his head. "Violetstar, Doveleaf! Violetstar, Doveleaf!" cheered Lilaclightning for the clan's new leader and deputy. Bluemoon padded into the BreezeClan camp, carrying a vole in her jaws. She made her way into the nursery, dropping the vole at the queen's paws with a dip of her head. Muddypetal padded into the BreezeClan camp, carrying catmint in his jaws. He made his way into the den he shared with Elkpaw, placing the catmint into the storage. Sunsetriver padded into the BreezeClan camp, carrying a squirrel in her jaws. She made her way into the nursery, dropping the squirrel at the queen's paws with a dip of her head. "Let all cats old enough to catch their own prey gather for a clan meeting!" yowled Violetstar from the center of the clan camp. Dreamheart pricked up her ears and padded over to hear what Violetstar had to say. "I, Violetstar, Leader of BreezeClan, call upon my warrior ancestors to look down on this apprentice. She has trained hard to understand the ways of your noble code, and I commend her to you as a warrior in her turn. Volepaw, do you promise to uphold the warrior code and protect and defend this Clan, even at the cost of your life?"